It’s that time of year again. Spring has officially sprung in Woodsock, GA and with that comes a most often unwelcome friend called pollen. As the flowers begin to bloom and trees begin to bud the pollen only increases. It bothers allergy sufferers bringing on the sniffles running and watery itchy eyes. Keeping pollen out of your home and office is pretty simple. But, what about your car or truck? 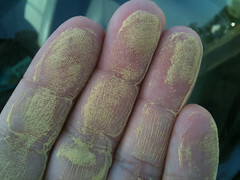 Pollen gets all over the outside and inside of your car. The team at Towne Lake’s Car Wash and Detail shares some easy ways to keep the pollen to a minimum on the interior and exterior of your car. Cabin Filter Cleaning: Since the year 2000 most cars and trucks have a cabin filter that helps clear the air of pollen and other pollutants in your vehicle. You should have your cabin filter changed every season to help keep your car air cleaner and also help with the efficiency of your car. If you don’t know where your cabin filter is located, or don’t know how t change it, you can contact an auto repair shop to see if they offer that service. Ride with Your Windows Up: If pollen really gets to you, one way to keep it out of the interiors of your car is to keep your windows up and use your A/C if it gets too warm. This way you will have less of the pollen blowing in your car. With regular detail service and wiping your interiors down between visits to your local car wash, you can keep the interiors cleaner longer. Wash Outside of Car Regularly: Keeping the pollen off of the exterior of your car will help to keep the pollen down inside the car as well. Washing your car regularly during pollen season is a good idea to help protect your paint from the damages that can come with pollen build up and scratches to the surfaces of the paint. For all your car wash and detail needs count on the team at Towne Lake’s Car Wash and Detail in Woodstock, GA. If you have any questions or would like to know more about our menu of services please contact us.